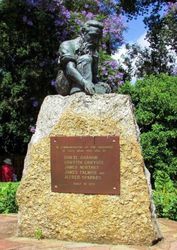 The statue of a miner commemorates the discovery of gold at Stockyard Creek. The statue was erected by the Apex Club of Foster. 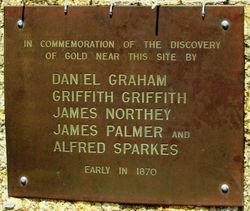 The plaque lists Daniel Graham, Griffith Griffith, James Northey, James Palmer and Alfred Sparkes as the men who found gold near this site in 1870 at Stockyard Creek, now known as Foster.